This nice weather has been fantastic for our family. 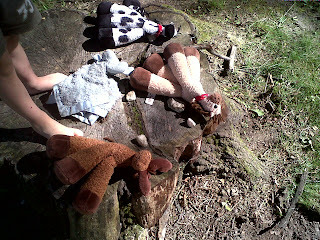 We have been un-cluttering the home, using less noisy plastic toys, and spending more time outside. Recently we have been using a lot of nature objects in our play. Rocks have become furniture, food, and a number of other things. We have made houses for our toy friends and even started a nature table in the house to collect things on our walks. TJ's imagination is blossoming with our creative play. It is wonderful to see. Every morning (very early) MJ walks me to the front door and bangs to go out. He is learning to sign "outside" and "shoes"! Here are some pictures of TJ with his toys outside. A while ago TJ came over and said he was going to the other end of the yard to watch the leaves grow. He invited me to join him and we lay on the grass watching the trees. I saw all of TJ's friends laying down and he said they were watching the sun with their new treasures. What have you been doing outside?